How to Define Your Target Audience for Social Media? Each social network is unique; they attract different types of users and each enables its users to share content in different forms. For a business with an online presence, it is fundamental to understand and identify the right social media channel to target the right audience for their business. A target audience is a group of desired people that are most likely to show interest in your product or service. A target audience is based on demographic data such as age, income, country, education, gender, etc. By understanding this, businesses can plan their marketing and advertising strategies based on the characteristics of that group of people in order to sell a product or service. Who is interested in their product or service? What problem does their company’s product or service solve? Who are their current customers? Is their product or service more appealing to men or women? What is an add-benefit of their product? If a business wants to maximize their return from social media, it is fundamental for them to identify their social audience. If a business is new and has not yet created a strong online presence, they can look at their competitors' audience and analyze it. Once a business identifies their target audience, they can begin to create a marketing persona for their target audience. A marketing persona is a fictional profile complete with the attributes, interests, goals, and behaviors of an ideal customer. Once an audience is defined, all aspects of a business, whether it is marketing, sales, product, etc. can streamline their approach to target them, meet their expectations, and share the right content with them. There is a strong relation with demographic data of followers and a business' social profile, and luckily, there are many tools to help you analyze the audience demographic (including Unamo Social). A business can use these tools to view competitor demographic data, or to compare their demographic data between their different social networks to determine why one is more active than the other. Business can use this information to begin targeting the right social channels and reach the right audience. For example, a recent study showed that 37% of the Snapchat users in the USA are between 18 and 24 years old, and just 2% are more than 55 years old. This means that if the product of a company is a holiday resort package for senior people, the social network Snapchat would not be the ideal place to promote this product because their target audience does not have a strong Snapchat presence. After deciding which social channels you want to target, it is crucial to continuously monitor your audience. Unamo Social Media will help you break down the data across one or many channels, or compare your data to your competitors'. You can analyze the sentiment, influencers, potential demographics, and much more! However, you can also do do this one at a time with the built-in insights of a social channel like Facebook Page Insights and Twitter Analytics. This will give your business valuable insights on who is following your page and their basic demographics. However, it is missing some core functionalities like comparisons of your competitors or other profiles, insider information on which influencers have liked your page, and what is the sentiment among their followers. 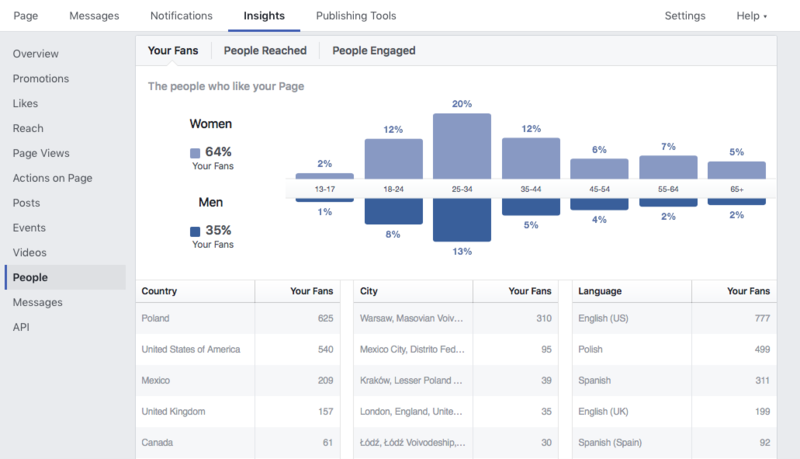 For example, within Facebook it is possible to get the demographic data of the current followers of a specific page such as: gender, country, city, language and age. This data is presented in the Facebook Page Insights section and is available for all the fan pages that were created on this social channel. A non-social tool that can also help a business begin to understand their audience demographic is Google Analytics. With Google Analytics, it is possible to know many details about who visits your website such as their age and gender, their country where they visited it from, and what actions they did when they visited. Understanding a demographic is crucial for businesses. It allows them to share content with their followers that engage them and promote certain actions. By monitoring a competitor or competing different channels, a business can cross-analyse their marketing persona and gain a wider reach. This reach can promote more online interaction. Sharing the right content with the right the people is a must for social growth.